The Country Room at Paradise Valley Lodge is a lovely bright sunny studio unit with a unique country cottage feel. There is a combined living / bedroom area with a large window seat, dining table and TV. There is a separate kitchenette with a large ensuite. 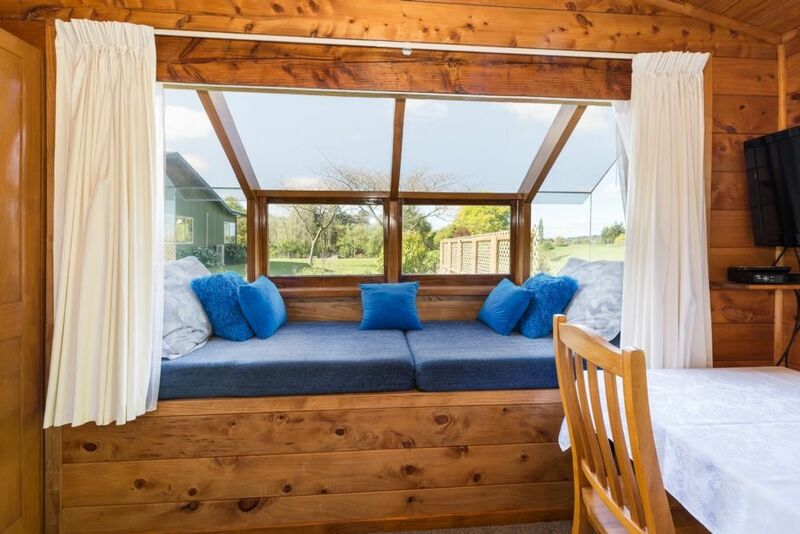 The window seat is perfect for lounging on and enjoying the views of the countryside and Mt Ngongotaha. With Mt Ngongotaha as a backdrop, beautiful tree studded country and garden views, trout stream and birds singing it really does feel like a piece of paradise. At Paradise Valley Lodge you can enjoy the freedom of "doing your own thing" and cook what you like when you like. Alternatively, breakfasts can be provided as an optional extra by prior arrangement if required. At the bottom of the garden the Ngongotaha Stream is open for trout fishing from December to June. The stream is closed for the spawning season between July and November, and this is the best time to see the wild trout. Thanks Lyn for your helpful and warm welcome. You provided an enjoyable stop on our busy road trip. Thank you for your comments. It was a pleasure to have you stay and the unit was super tidy and clean when you left. Peaceful and beautiful gardens to enjoy. Beautiful quiet location but only minutes from Mitai Maori village and the town itself. Great communications from the host, who kindly arranged a reservation for us at Mitai. The only disappointment there was the buffet meal - try to get tickets for everything else but that and you’ll save over NZ$40 per head and, in our opinion, be much happier.That is no reflection on the property, just a travel tip for visitors. So glad you enjoyed your stay with us. Safe travels. Very cosy, clean and exactly as described. Hosts were lovely. Great, relaxing stay. Had everything we needed.